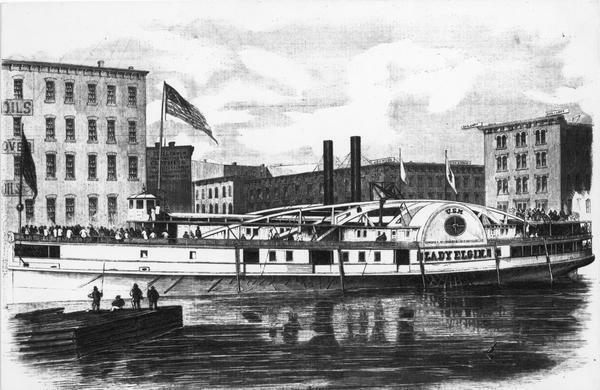 In one of the worst maritime disasters in the history of the Great Lakes, the steamship Lady Elgin sank off the coast of northern Illinois during the early hours of September 8, 1860. The ship left Milwaukee late on September 6 bound for a political rally in Chicago with approximately four hundred passengers on board, including members of Milwaukee’s “Union Guards” militia unit. Returning amid heavy rain and high winds, the Lady Elgin was struck by the lumber schooner Augusta shortly after two o’clock in the morning and sank within half an hour, leaving fewer than one hundred survivors. Of those that perished, the majority were Irish residents from Milwaukee’s Third Ward. ^ See John Gurda, The Making of Milwaukee (Milwaukee: Milwaukee County Historical Society, 1999), 95-96; Ted St. Mane, Lost Passenger Steamships of Lake Michigan (Charleston, SC: History Press, 2010), 68-69. Hilton, George Woodman. Lake Michigan Passenger Steamers. Stanford, CA: Stanford University Press, 2002. St. Mane, Ted. Lost Passenger Steamships of Lake Michigan. Charleston, SC: History Press, 2010. In the days after the sinking of the Lady Elgin there was chaos and confusion in the early reporting of victim names and victim count, similar to the experience following the September 11, 2001 terrorist attacks. But in the weeks following both disasters the names and numbers of victims and survivors came into focus. However, as the years passed, reports of the number of people on the Lady Elgin burgeoned. Number’d in that three hundred, who failed to reach the shore. Modern day research and analysis of many records regarding those involved has led to evidence for 396 passengers and crew, 302 of them victims. The reason for these higher estimates many years after the disaster were the lists of passengers printed in newspapers in the days after the sinking. Milwaukee and Chicago, the most affected cities, printed the most about the disaster. We have at least ten different newspapers from these places available to us today, and they printed dozens of lists. Additionally, every Great Lakes’ city’s newspapers printed lists, as did Wisconsin newspapers and those throughout the country, including the New York Times. Virtually every newspaper list included factual and spelling errors. There were people listed as being passengers, but who were not: like Gurdon Hubbard, the owner of the Lady Elgin, and Philip Best, leader of Milwaukee’s recovery operations. Many names were misspelled. Thomas Shea, a survivor, had his surname misspelled in newspaper lists as Shay and Chase, and Philip Aylward’s last name was printed as Elywood, Elwood, Elward, Elmore, and Ellsworth. The current day researcher can easily be misled about the number of people on the Lady Elgin if the names reported in newspaper lists of the time are simply accumulated without further analysis. ^ “Fred Snyder’s Statement,” Daily Wisconsin, September 10, 1860, 1. ^ “First Mate, George Davis’ Statement,” Chicago Daily Journal, September 15, 1860, 1. ^ Journal of Board of Supervising Inspectors, National Archives Record Group 41, vol. 1, p. 42-43. ^ Valerie Van Heest, Lost on the Lady Elgin (Holland, MI: In-Depth Editions, 2010), 39. ^ “Loss of the Lady Elgin,” Milwaukee Sentinel, September 4, 1892, 1. ^ “Sinking of the Lady Elgin,” Wisconsin Official Marker, Erected 1996, N. Water and E. Erie streets. ^ Van Heest, Lost on the Lady Elgin, 95. ^ Charles Scanlon, The Lady Elgin Disaster (Milwaukee: Cannon Printing Co.?, 1928), 96.